Parasitic infections of the CNS are a public health challenge to the developing world. During the past few decades, increased tourism, migratory movements, and the AIDS epidemic have facilitated the spread of formerly geographically restricted parasitic infections that now affect thousands of people living in developed countries. Parasites are classified into protozoa and helminths, and the latter are further divided into cestodes (tapeworms), nematodes (roundworms), and trematodes (flukes). Parasitic infections are highly pleomorphic due to the unpredictable nature of the immunological reaction of the host against parasites as well as the many pathological lesions that these organisms may cause. 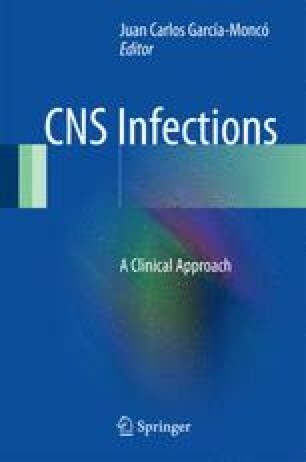 Parasitic infections of the CNS may cause subacute or chronic meningitis, encephalitis, space-occupying brain lesions, stroke, and myelopathy. Diagnosis may be difficult due to nonspecificity of clinical manifestations and neuroimaging findings and the poor reliability of some of the most commonly used serologic tests. While the introduction of potent antiparasitic drugs has improved the prognosis in many patients, therapy still remains anecdotal for most of these conditions.